Just like all the characters mentioned above, it's in the pages of comic books and novels that this world can really come alive and we can delve into the interesting corners of the galaxy. I have lots of fond memories of reading all the mini-series that came out after The Phantom Menace (Jango Fett: Open Seasons was a personal favorite) and learning more about adventures that were just off screen. 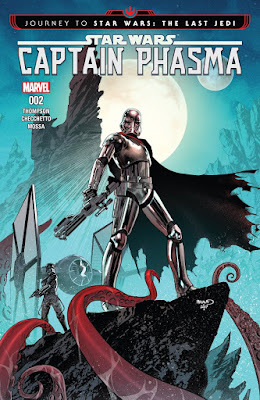 When I say that Marvel's Captain Phasma four-issue comic book mini-series reminds me of the glory days of the Expanded Universe during the Prequels, I'm giving it the highest compliment. This book is a part of Disney's "Journey to Star Wars: The Last Jedi" wave of publications that are meant to build anticipation for the film and introduce us to people, places, things, and plot elements that will be a part of Episode VIII. I recently wrote a review for another book from that wave of stories, The Legends of Luke Skywalker, which left me pretty cold and failed to deliver an engaging story that felt like it mattered. Star Wars: Captain Phasma is exactly the opposite. Though the events that occur in the pages of the book might not feel like they're breaking any serious ground, I think Captain Phasma gives us some insight into who Phasma really is under the shiny armor. The story picks up in the middle of the events of The Force Awakens, with Phasma being relegated to the garbage chute on Starkiller Base. Without going too deep into TFA, it's Phasma that shuts down the shields of the planet-destroying facility. The Marvel mini-series tells us that someone in the First Order was aware that SHE was the one who lowered those defenses. For Phasma, this is a loose end, and all loose ends must be eliminated. In hot pursuit of her target, Phasma is accompanied on her mission by a TIE-fighter pilot and finds herself on a planet called Luprora where she must face the locals and a larger threat. Honestly, I'm really bummed that it was only four issues and not six, or even a 12-issue maxi-series. The story as presented in these four issues would make an awesome half-hour animated short. That's great, but I want the whole movie! The writing by Kelly Thompson is top-notch, offering us a very tiny glimpse into the psyche of Phasma and what makes her tick. Thompson makes sure that Phasma is not entirely unsympathetic, but the characterization is true and consistent with the hard-case that we know from the films. We don't really know a whole lot about Phasma, yet this comic gives us a lot more time with her than the movies ever could, deepening our understanding of the First Order's most famous captain through characterization, not exposition or cumbersome backstory. 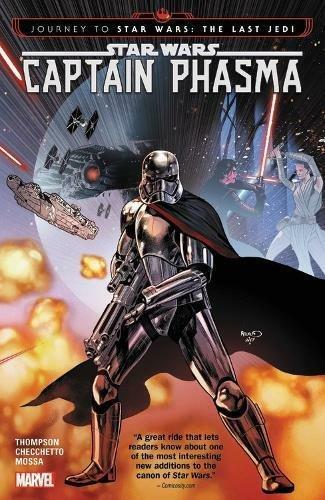 Part of what makes this such a great read is that Kelly Thompson really digs deeper into Phasma's personality (for lack of a better word), exploring the duality of a soldier who is clearly feminine and yet incredibly powerful and ruthless. That exploration is really at the core of Phasma, and has been a part of what makes the character so compelling from the beginning (to me, at least; I realize the character has left some people flat). Thompson knocks it out of the park, and never pulls any punches, either. The Phasma we see in the pages of the comic is just as brutal and violent (probably even more so) than the one in the movies. 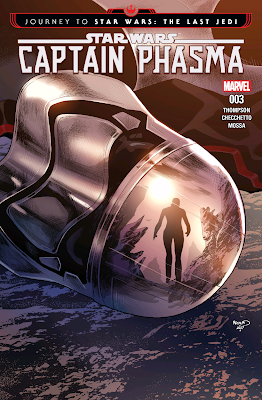 Furthermore, Thomspon writes the TIE pilot that accompanies Phasma also as being multi-faceted. How in the world (or the galaxy) do you write characters that are blatantly evil (both Phasma and the pilot, TN-3465, are loyal to the First Order), yet still give them layers and nuance so that they're not just one thing? I'm so impressed that I now feel compelled to track down Thompson's work on the Jem and the Holograms comic she's writing for IDW. Likewise, the art from Marco Checchetto is outstanding. Phasma totally looks like Phasma, but there's a part in the story where she changes from her famous armor to something more incognito. To Checchetto's credit, the character STILL retains the characteristics of Phasma even while not wearing the costume that we know so well. His compositions are dynamic and I rarely got lost in the continuity of the scenes themselves, which is something that happens more than I'd like when reading modern comics with their ultra-detail. Furthermore, Checchetto does a great job at conveying the different emotions that Phasma is feeling, which is really difficult when all you have is a hard helmet that can't emote. Unmasked characters can emote all day long; even Spider-Man's eyes can widen and narrow, but "acting" with a helmet on requires an understanding of body language. I give high praise to the artist for conveying that body language in his pencils. I got this story via the trade paperback, which has several of the alternate covers in a gallery at the back of the book. Honestly, things like this make me think that Marvel would rather we skip the monthly issues and just pick up their collections. This book gives readers many of the pieces of art, including some conceptual sketches, associated with this comic book in one convenient package. This is why so many people, myself included, are now "waiting for the trade." I realize that I'm gushing about Star Wars: Captain Phasma, but I'm totally okay with that. As someone who has read scores and scores of stories within the Expanded Universe, I feel like I have developed an eye for contributions that pair great talent with a story that's begging to be told. In this case, the story is even more necessary because the movies themselves don't bridge the gap they've created. While this story is not absolutely essential to enjoy and appreciate the character of Phasma, it definitely offers fans something that the movies alone do not. All too often, these novels and comics can feel boring and disposable. 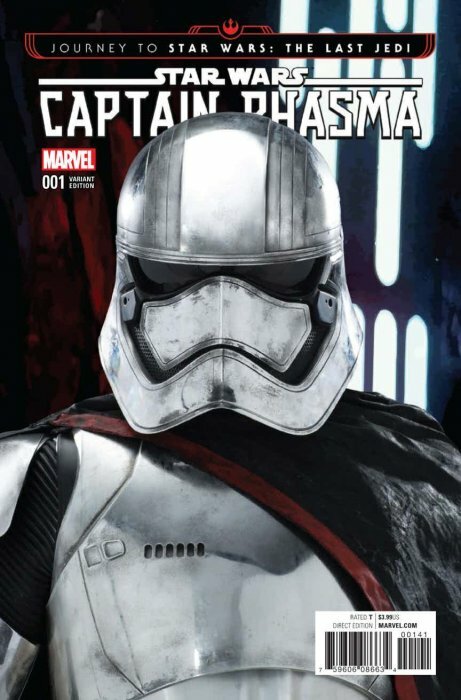 In contrast, Captain Phasma feels like it's bursting with potential. 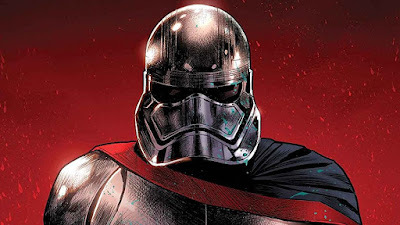 Here's hoping for more Phasma from Marvel in the near future.